From St. Cloud, Minnesota comes the American Mountain stem. It's made of 6061-T6 TIG welded aluminum, then hand polished to a high luster. Where many aluminum stem makers actually use aluminum tubing to make their quill, the quill of this stem is from a piece of solid aluminum rod. The rod is drilled through, top to bottom, making 9.5mm hole for the expander bolt and the snug fitting recess for the expander bolt head. After drilling, the quill wall thickness is a massive 6.3mm leaving a very sturdy and rigid quill. The extension is large in diameter, and not ovalized. It is made of aluminum tubing, with a deep miter cut, so the extension wraps around the sides of the quill. The beefy aluminum binder tube is over three millimeters thick, uses a single binder bolt, and has a 25.4mm inner diameter. 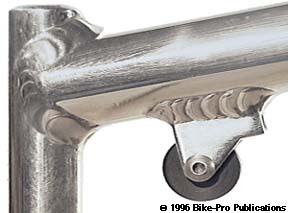 The binder fittings are machined from aluminum rod. The rod is drilled from both ends, to make the bolt travel hole, the recess for the bolt head, and recessed nut. The binder tube side of the fitting is given a half round shape so the piece contours the binder tube at time of welding. The nut side of the fitting has a serrated side, steel nut pressed into the fitting from the bottom so you needn't worry about threaded aluminum stripping out. As you can see from the images all the tubes and the binder fittings are TIG welded with broad bead. 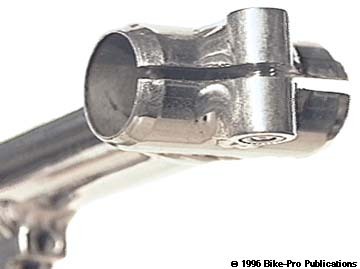 Even the binder fittings are massively welded prior to the front of the stem being sawn through, to create the binder cinch system. 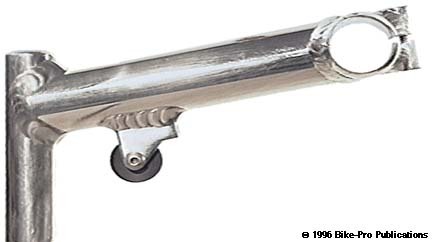 The expander bolt is made of chrome plated steel, is 120mm long, with a 8mm by 1.25mm thread pitch. The expander bolt has a 6mm allen head and weighs 45 grams. The binder bolt is made of chromed steel, has a 5mm allen head, with 6mm by 1mm thread pitch, and is 25mm long weighing 7 grams. The expander wedge is made from machined aluminum rod, which has been turned to the precise diameter, cut, drilled, and tapped. The American mountain stem is made in cable hanger cable. The entire stem is high polished, bringing the surface to near mirror-like quality. American stems are made in three lengths, 102mm, 121mm, 140mm. They are also made in 4 rises, 0 degree, +19 degree, +23 degree, and +30 degree. Any rise is available in any length, however these stems are, at the moment only available in the 1" size. A 19 degree rise version of the Mountain stem with the roller/stop guide routing, in the 140mm length weighs 319 grams. Specify length and rise.